Moms, it’s time to take me out to the ballgame! Here’s how this early bird is surviving baseball season. Extra coffee, please! This post is sponsored by RaceTrac. All sporty opinions are my own. Whoever said that “the early bird catches the worm” obviously never had kids. I admit that this mom has never been the early riser. Overcoming my serious dislike for early mornings has now been multiplied exponentially. Why, you ask? It’s officially baseball season. I somehow blinked and now have two kids playing baseball, with games starting as early as 8 am. 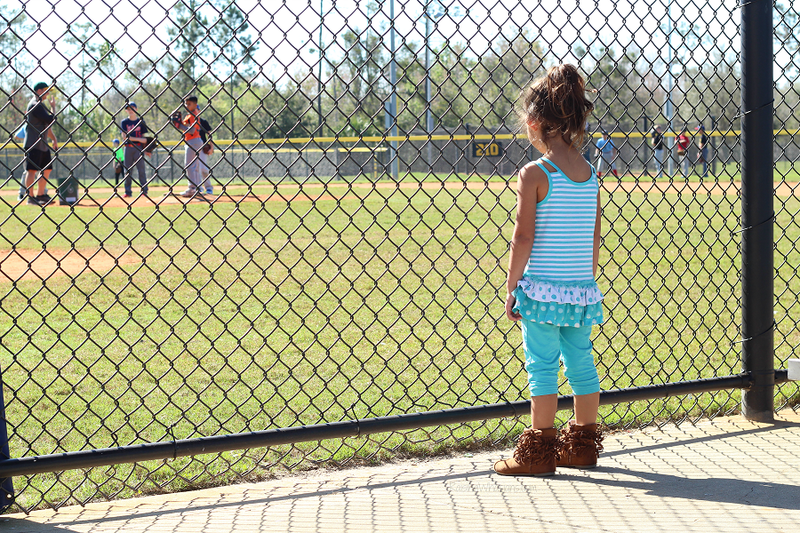 Between my girl’s first tee ball games to my son’s now 2-hour intense games, I can officially say that I’m…tired. But it’s time to put on super mom pants and come out swinging (with baseball bats, of course). 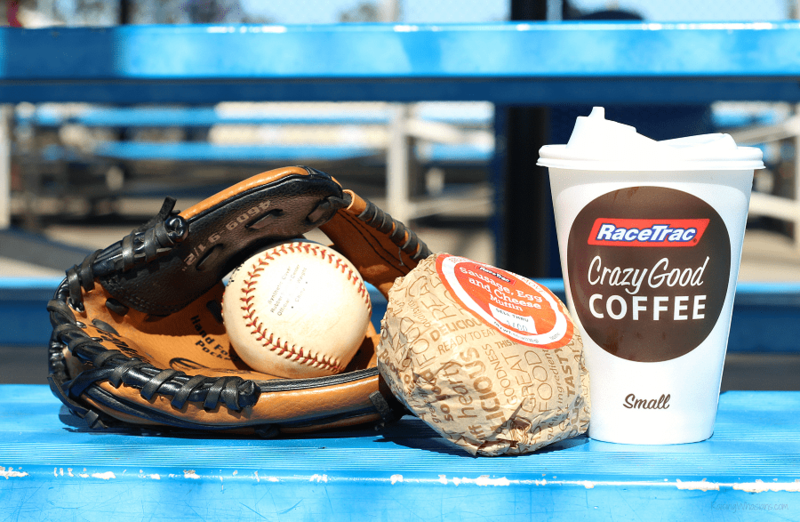 Here’s how this early bird is surviving baseball season with RaceTrac – extra coffee, please. Red socks, check. Grey pants, over there. Washed shirts, in the dryer. And where are those hats again? Welcome to our Saturday morning routine. Rushed and groggy, I may have a few choice words for those coaches that scheduled our 8 am game time slot. It’s tough to make sure that I have two kids that are dressed, fed and out the door in the early morning hours. And oh crap – guess who forgot to make breakfast for myself, yet again. Before we hit the field, we head to our local RaceTrac, where Crazy Good Coffee is always required. New for 2018, RaceTrac now has new coffee machines where you can watch your beans grind right before your eyes for the freshest cup of coffee every single time. 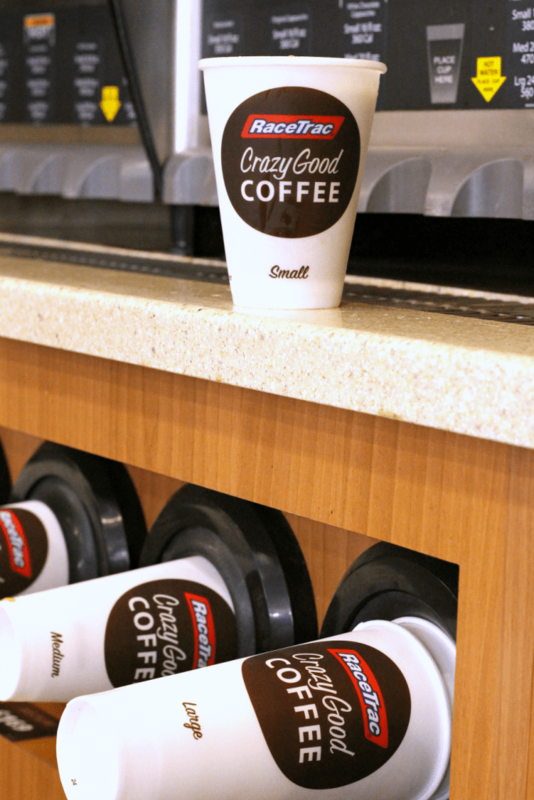 A shot of Hazelnut, a pour of my favorite creamer and one of six blends of freshly brewed coffees at the Crazy Good Coffee bar – that’s the difference between the mom that is cheering every play and the mom that’s barely making it through one inning. RaceTrac always has amazing coffee ready to greet me – and those large cups at a family-friendly price make it easy for me to survive my Saturdays at the baseball field. A few sips in and my groggy morning demeanor instantly changes into Baseball Mom of the Year. Winning. The key to my baseball mom heart? A hot breakfast. Long days under the Florida sun mean that I need a good breakfast to survive those back-to-back hours on the bleachers. Thank goodness that RaceTrac has a variety of delicious breakfast options, whether you’re the breakfast sandwich mom like me or the hot dog and soda mom (I don’t judge). 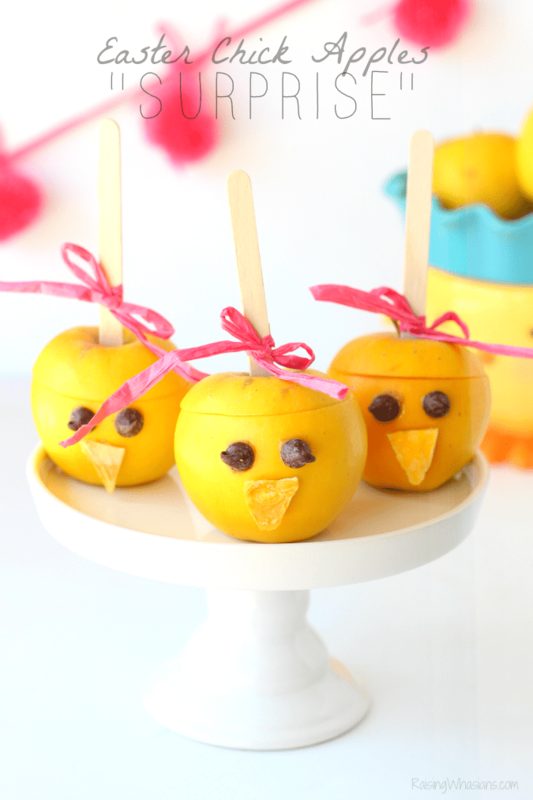 No matter what kind of early bird you are, we all can use a boost for our busy mornings. 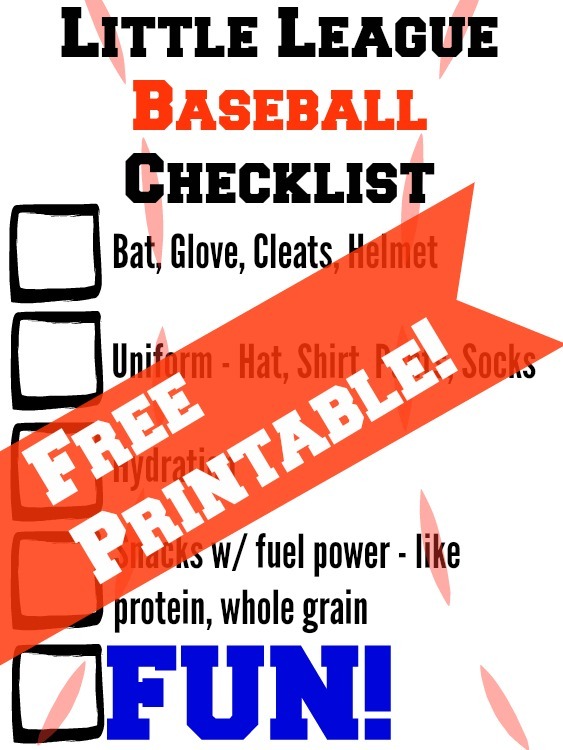 I’m surviving baseball season with my secret weapon – RaceTrac. 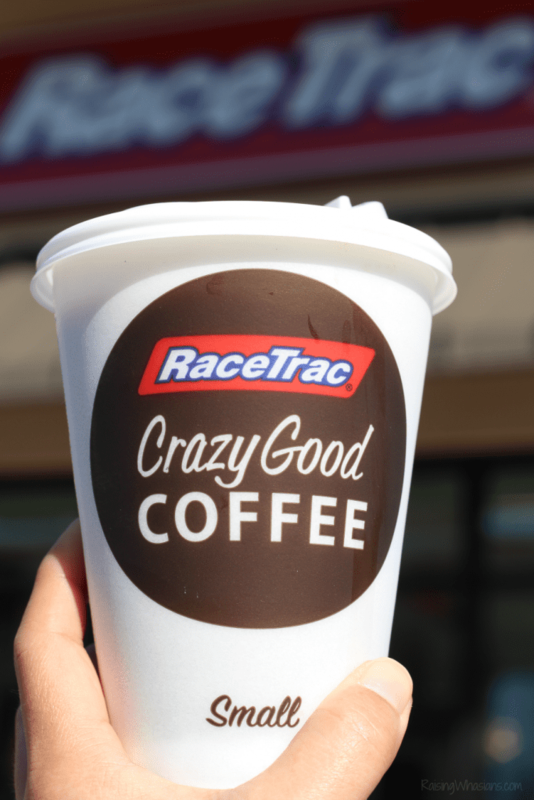 Head into your local RaceTrac and make those early mornings better. Be sure to follow RaceTrac via Facebook, Twitter and Instagram for the latest delicious early bird offerings, exclusive deals and more. 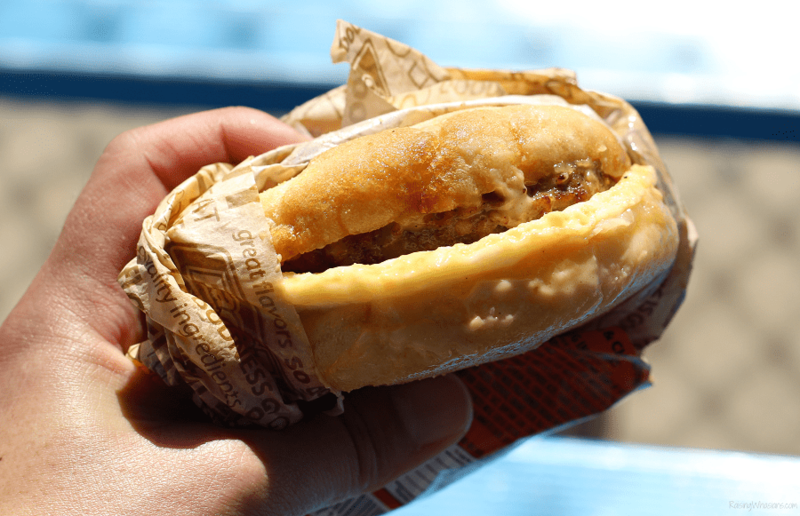 It’s time to hit the fields with delicious coffee and my Sausage Egg and Cheese Muffin in hand. Play ball! 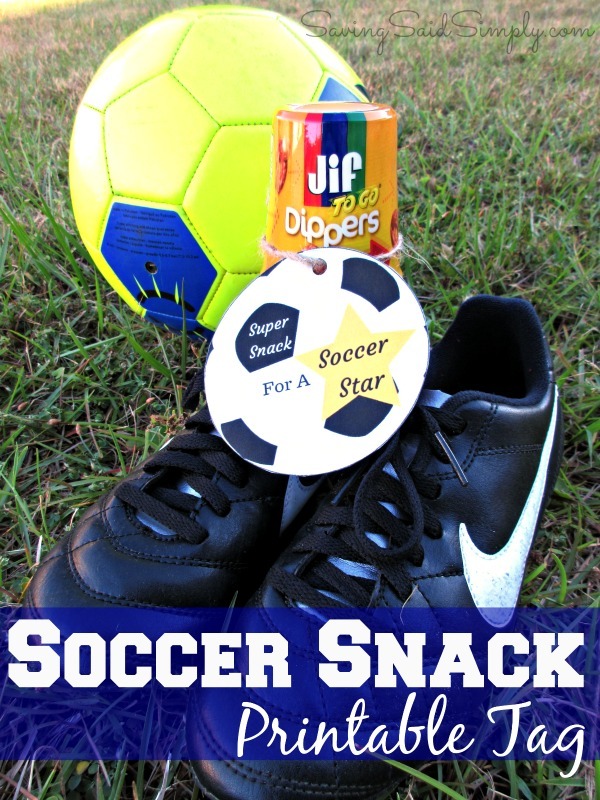 Disclosure: This giveaway is sponsored by RaceTrac. Raising Whasians is not responsible for prize fulfillment. One winner will be randomly selected using the Rafflecopter random selector and will be notified via email. Once notified, the winner will have 24 hours to respond or a new winner will be chosen. This giveaway is in no way associated with Facebook, Twitter, Instagram, Pinterest or Google. Void where prohibited. This disclosure is made in accordance with the FTC 10 CFR, Part 255 Guides Concerning the Use of Endorsements. Be sure to follow Raising Whasians via Facebook, Twitter, Google, Instagram, Pinterest and YouTube for more of your favorite giveaways! I would get a sausage egg and cheese muffin. Yum! Breakfast on the go for busy mornings! Bacon, egg and cheese sandwich along with a bottle of Coke. I need my soda in the morning. Bacon, egg and cheese sandwich is my favorite. Aw, she is such a cutie! Like Mama! 🙂 I would definitely grab some coffee and maybe a protein or granola bar. Those two items help my mornings, especially the coffee, lol! Well I would be giving this to my daughter who attending college in Florida. I’m sure she would get a coffee and a bagel. A bagel with cream cheese and a bottle of water. An Energy Drink! I need them to kickstart my day. Terrible, I know, but a Yoo Hoo and a Honey Bun is my breakfast of choice!! A cup of black coffee with a donut. I would get a breakfast sandwich. I would get a breakfast sandwich and donuts to fuel my morning! Coffee!! I love my coffee in the morning. I always need coffee in the morning … and a bagel is nice, too! I can’t function without my coffee in the morning, and maybe a breakfast sausage sandwich too! I would get the coffee and egg sandwich. I don’t typically get food at the gas station but I do grab a large bottle of water or sometimes I’ll grab a slushee and act like a kid again lol. Some donuts and a coffee! A sweet treat to start my day! I would definitely get a coffee and either an apple fritter or fruit cup. I’d get a large coffee. Their website is just so user unfriendly to maneuver through. However, I do like their biscuit breakfast sandwiches. I will get a orange juice in the morning. Bacon, egg and cheese sandwich and a large coffee for me. What would you get to fuel your early bird mornings at RaceTrac? I would get a nice hot coffee and a blueberry muffin! The egg sandwich would be perfect for breakfast on the go! I would grab a coffee. I’d get an iced coffee. I would get a muffin and a cup of hot coffee. I’d fuel up with a cup of hot cocoa. I’d need a large coffee and two donuts. i like to fuel my day with coffee and donuts. it is the best way to start the day. I would get coffee and doughnuts \!! Racetrac does have a great breakfast on the run station. Always something appealing for me to grab & go. I would get a large French Vanilla coffee with a Bacon, egg and cheese sandwich. I would get a Taquito and a large dp.. I would definitely get a coffee and a bagel! SOunds like a breakfast sandwich! Thanks so much for the chances to win. A cup of coffee and a sausage biscuit, please. Coffee and lots of bananas to keep in my purse for snacks later! I would get a sausage biscuit and a cola. breakfast Burrito !!! Diet Soda !!! Soda and a sweet cake, i know odd. I would get the sausage and egg muffin. I would get an egg sandwich for breakfast. I’d love the croissant sandwich. Yum! I go for the coffee, and yet, more coffee.